This selection of Iona Rozeal Brown’s work presents male figures appropriated from traditional Japanese woodblock prints and radically transformed through an overlay of hip hop style. Brown’s ongoing project, collectively called “a3,” or “afro-asiatic allegory,” was born of the artist’s encounter with the ganguro phenomenon: Japanese teens who since the 1990s have adopted extreme fake tans – hence the moniker ganguro, which translates literally as “black face” – along with cornrows, afros, and the high-bling sartorial markers of American hip hop iconography. Brown is concerned with the stylistic appropriation of African-American cultural forms and with the global construction of identity through consumerism. Formally, her distinctive work combines textures, forms and colors in flat, patterned paintings with collage on paper in order to suggest cultural overlay. 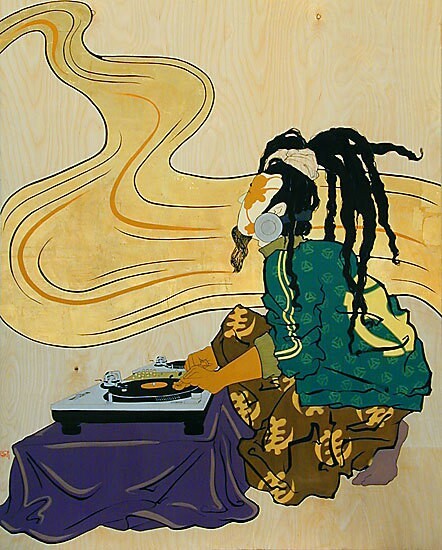 Based on print sources from Japan’s Edo period (1600-1868), the work contemporizes the dramatic Ukiyo-e tradition – popular genre pictures of the “floating world,” a hedonistic, after-hours milieu inhabited by geishas, Kabuki actors, and samurai – to represent unexpected hybridities born of cultural sampling and material excess. By invoking the extreme mediation of experience and meaning, Brown’s work provocatively calls into question the power of image, as well as the appeal of surface over the substance of cultural forms. What are we to make of the hip hop idols represented here, of these postured and preening masculinities, in light of the samurai on whom they are modeled? The connections are suggestive, far reaching, and wry. Ultimately, Brown’s work asks viewers to consider apprehension, ownership, authenticity, and identity amidst the connectivity and distortions of globalization. UAMA thanks the private individuals whose generous loans made this exhibition possible; Caren Golden, of Caren Golden Fine Art, in New York; and Annie Gowlak, of G Fine Art, in Washington, D.C.